Our pure maple syrup is made by collecting and condensing maple sap in northern Vermont. Nothing is added – only water is evaporated away. It takes approximately 40 gallons of maple sap to produce one gallon. 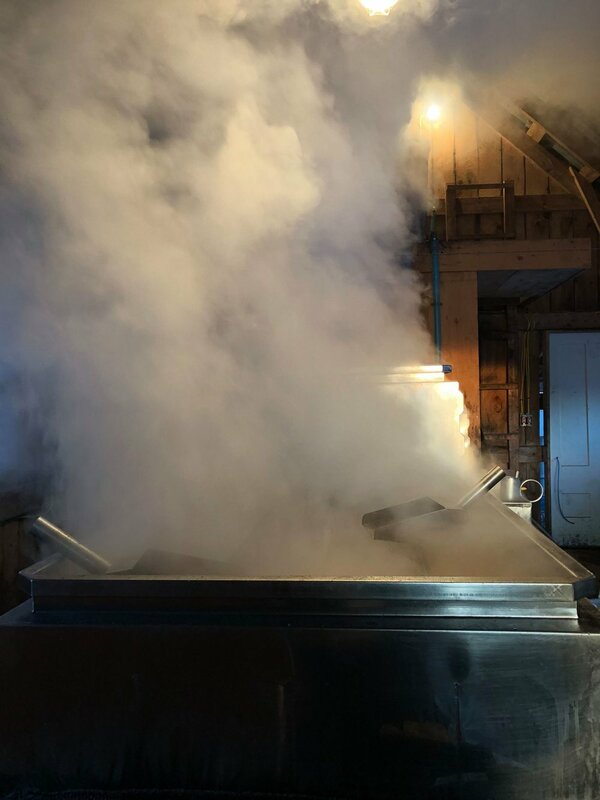 Maple sap runs only in the springtime when the nights are below freezing and the days are above freezing – conditions, production, and quality vary day to day and year to year during the short 6 week season. 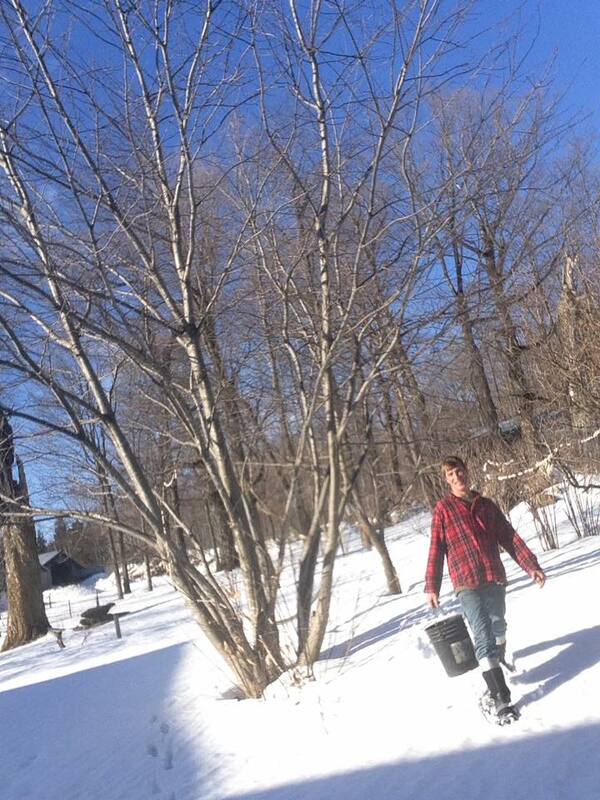 Collecting maple sap is labor intensive but rewarding providing the farmer with time in the woods and good exercise. Each tap will produce roughly 10 gallons of sap over the season. Steeped in history and full of lore, the old timers utilized buckets and spouts to collect sap at each tree. One, two, or three buckets would be hung on each tree and the sugar maker and family would collect the buckets individually after each sap run. Powered by horse, oxen, bulldozer, or tractor – winter weather and tough terrain made each gathering an adventure. I can remember spilling as much sap as we gathered as we plowed through the snowy woods. Modern sugar makers use food grade plastic tubing and gravity to interconnect each maple tree and consolidate the gathering to a centralized low spot in the woods. While this method simplifies the gathering, it still provides the farmer with ample time in the woods to string lines, thin the woods, and maintain the extensive network of piping. Vacuum can also be utilized to improve production and help with low spots in the sugar bush. Ledgenear Farm utilizes both buckets and tubing in our woods. Once gathered and delivered to the sugar house, the sap is stored in large stainless steel tanks at a cool temperature. When there is sufficient quantity, we “fire up the arch”; our wood fired 4×12 evaporator, and boil the sap. Sparks shoot from the smokestack, and aromatic steam billows from the roof top, doors and windows, and every crack and seam in the sugar house. Sugaring can take a long time – if the sap is running we boil until it we catch up – often into the early morning. Hot syrup by the cup works better than coffee! The Maple syrup is ready to “draw off” when it is at 217 degrees Fahrenheit and has a measured density of 67% sugar. Boiling it too little makes it watery and boiling it too long turns it into crystal sugar. Because it takes so long to boil off 39 gallons of water for each gallon of syrup, many sugar makers utilize a reverse osmosis machine to “sweeten the sap” and reduce the boil time in half or in quarter. While we have nothing against the RO, we are not yet large enough to require one and in the meantime take some pride in doing it the old fashioned way. To help us better balance our supply and demand, we additionally purchase organic maple syrup from our neighboring producers. These small producers share our commitment to quality and sustainability and we are lucky to be able to contribute to their viability. The hot maple syrup is filtered through a mechanical press to improve clarity and to remove any sugar sands or solids. The syrup is graded for color and categorized as Grade A: Golden Color with Delicate Taste, Grade A: Amber Color with Rich Taste, Grade A: Dark Color with Robust Taste or Grade A: Very Dark Color with Strong Taste. The graded syrup is hot bottled into glass containers with tamper proof lids sealed in place. Maple Syrup will store for a year or more in an unopened container. Unopened syrup should be kept in a cool dark place. Open containers of syrup should be kept refrigerated and may be frozen to extend shelf life. Maple syrup may develop crystallization similar to honey, but this does not affect the remaining syrup. Our maple syrup is delivered in recyclable packaging designed to prevent breakage during shipment. Please re-use or recycle the packaging! Sign up with your email address to receive news and updates about our farm. Copyright @ 2019 Ledgenear Farm, all rights reserved.